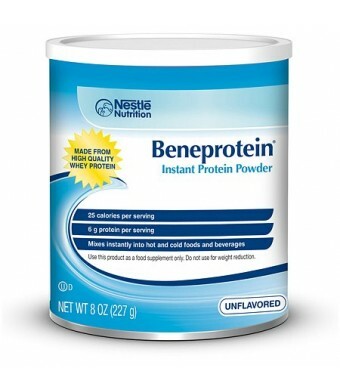 If you are looking for an extra protein punch then look no further than Resource Beneprotein. Better than traditional protein bars, drinks or shakes, Beneprotein powder can be mixed easily and instantly into most foods and beverages without separating. Get all the great benefits of a high protein diet with this all gain, no pain gluten and lactose free supplement. A concentrated source of high-quality protein, each scoop contains six grams of whey protein and only 25 calories. 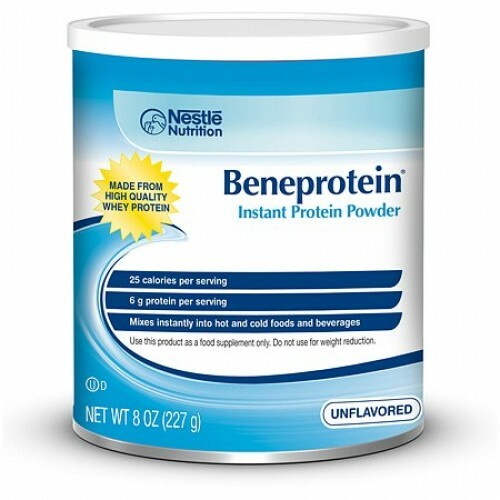 For the outstanding results and nutrition a protein diet can provide, try Beneprotein Instant Protein today. Package contains six 8oz cans. Resource Instant Protein Powder: A concentrated source of high-quality protein you can add to foods or beverages to increase their protein content. Mixes easily and instantly into most foods and beverages without seperating for better tasting, more enjoyable meals. Each scoop provides 6 grams of high quality protein and 25 calories. Simple to use: 1 scoop=1 serving, all in a handy resealable canister. App roximately 32 servings per canister. Resource Instant Protein Powder is a medical food - please consult your health care professional on the use of this product. Quickly disperses for tube feeding applications. Stir one scoop into at least 4 oz of most hot or cold beverages or prepared soft foods. Add one scoop of powder into 2-4 fl oz water. Administer by syringe through feeding tube.